Ethan Stowell’s Lagana Foods partnership honors tradition in conjuring the shape of things to eat. Ten years ago, before he was a Seattle superchef, Ethan Stowell met specialty-food-market veteran Kaela Farrington while cooking on the line at Nell’s Restaurant in Green Lake—and the makings of a future partnership began. Before opening his pasta-focused restaurant Tavolàta in 2007, Stowell bought an Italian pasta extruder. Farrington, enamored of the device­­, began urging her friend to start his own pasta company. 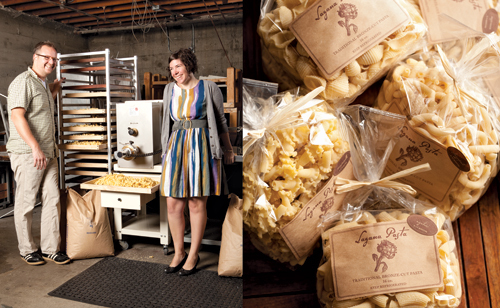 Stowell asked Farrington if she wanted in on the project in 2008, and last January the two launched Lagana Foods (laganafoods.com), offering eight kinds of traditional pasta. Unlike their restaurant counterparts, these pastas contain no eggs—only semolina flour and water. This allows a longer shelf life and “highlights the flavor of the flour, which can be somewhat masked by the richness of eggs,” says Farrington. The pasta machine uses traditional bronze dies, which leave a coarser surface on the noodle so the sauce can cling better. The Lagana pastas are all of the short variety, each with a distinctive shape and traditional Italian name (such as campanelle, meaning “little bells”), suitable for different sauces. Customers are encouraged to experiment with the shapes. Farrington recommends the roughly formed radiatore (it looks like a tiny radiator) for heavy ragù sauces and the twisted casarecce (literally “homemade”) for thinner, tomato-based ones. Lagana sells 16-ounce bags ($6.29–$8) at specialty food stores, including DeLaurenti Food & Wine, Metropolitan Markets and Whole Foods. And as lagana (Latin for “thin sheets of dough”) is actually traditional long pasta, look for the company to expand to longer shapes.